Seattle architect Brett Holverstott is putting the finishing touches on the design of a passive house to be built on the shores of Lake Chelan this year. The home will be located on the north shore of the lake and will face south, which Holverstott says helps make its an ideal candidate for passive design. A passive house incorporates super-insulated floors, walls, and roof; air-tight enclosure; high performance windows primarily oriented to the south; and a heat recovery ventilator (HRV) which uses the outgoing air to precondition the incoming air. The architect’s sketch of the sustainable, passive house to be built on the north shore of Lake Chelan this summer. “The combination of these devices, effectively used, produces a house that requires no furnace and almost no ductwork, has fantastic indoor air quality, no annoying drafts, and can be heated with a light bulb,” Holverstott states on his website, cambrian-design.com. 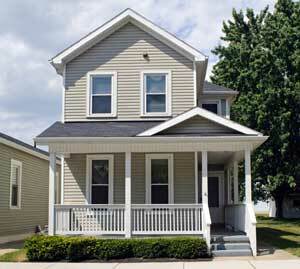 A passive home can consume 85 percent less heating/cooling energy than a typical home. Construction is scheduled to start in late May or June. Brothers Mike and Mark Schramm of Green Gables Construction, Chelan, are the builders. The home will be 1,150 square feet. The basement/foundation will be buried in the earth. The home will feature a large shed roof that lifts toward the lake view. An entry court between the house and garage will serve as a view deck, providing “a moment of pause” before entering the home, Holverstott said. The exterior walls will be a foot thick and of double-wall construction, with a 2′ x 6′ wall with structural plywood sheathing on the exterior side, and a 2′ x 4′ wall with the drywall on the interior side. “The resulting cavity can hold a lot of insulation,” Holverstott noted. Some of the decisions about building materials are still being made, but Holverstott said he would like to use Forest Stewardship Council (FSC) certified lumber and plywood. The insulation in the walls will be densely packed cellulose, a byproduct of newsprint, which contributes to air-tightness. The insulation in the roof cavity will be blown-in fiberglass, because of its lighter weight. The home is the retirement dream of Rick and Jacque Hyler of Renton. Rick just retired from Boeing and Jacque is a part-time tutor. It will be their permanent home, not a second home, Holverstott said. He said the home will be a demonstration of affordable green design. “The cost of the design is targeting $200,000 including all ‘soft costs’ such as utility hook-up fees, permit fees and architect fees,” he said. “This is a difficult target to reach in today’s dollars, and we have had to reduce the square footage of the house from 1,500 to 1,150. The owners have opted to save some money by bargain hunting and installing interior finishes themselves. But they’re committed to acquiring top-of-the-line energy efficient appliances to contribute to energy savings. 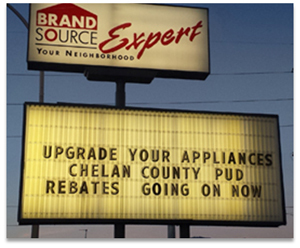 They’ll take advantage of Chelan PUD rebates where possible. Holverstott established Cambrian Design last year after working on science laboratories, commercial interiors, single and multi-family housing and even a jazz venue. This is his first independent venture. You can learn more about this project on the Cambrian Design blog. What’s not to like about free? The Chelan-Douglas Community Action Council wants to remind residents that it’s open for business, providing free insulation and sealing against drafts for eligible households. Joanne Knouf, program coordinator, said her agency can improve the comfort of homes by installing energy efficient measures such as attic, wall, floor, water-pipe and duct insulation. Some heating system and ventilation improvements also are available. Sealing cracks, gaps and holes around doors, windows, pipes and wiring that penetrate the ceiling, floor, and other areas with high potential for heat loss. Sealing furnace ducts, which can account for 20 percent of heat loss. Installing or replacing dryer vents, which can allow moisture and air into the home if not vented properly. Providing proper ventilation to the home to prevent moisture buildup. Installing insulation in walls, floors and ceilings, around ducts, pipes and water heaters, and near the foundation and sill. To be eligible, customers must live in Chelan or Douglas county in either single- or multi-family homes. Incomes must be at or below 200 percent of federal poverty guidelines. The program is open to homeowners and to renters with landlord permission. Both Chelan and Douglas PUDs provide funding for this program. The agency also receives state and federal funding. To apply for weatherization services, call (509) 662-6156. Come in from the cold and learn how to keep your home warm and efficient at Building NCW’s Home Show Feb. 7-9 at Town Toyota Center. Don’t be left out in the cold — warm up to energy savings at the Chelan PUD booth at the Building NCW Home Show Feb. 7-9. Whether you’re building, remodeling or buying a new home, Chelan PUD staff can help you choose quality products for long-term savings on electric bills. Stop by our booth and enter our drawing to win a Nest thermostat with installation by Alpine Aire of Wenatchee — a $480 value. See a ductless heat pump on display and learn about our $750 rebate on this super-efficient technology. Pick up a flier listing our rebates on appliances, windows and insulation. Ask our energy experts your vexing questions about energy use in your home. We’re here – and there at the home show — to help. This is the 11th year for the builders’ home show, which brings dozens of businesses under one roof offering remodeling, construction, design, decorating, landscaping, financing and real estate services. View the flier, and we’ll see you at the show!